The Ford and Edison Winter Estates provide a glimpse into the intimate lives of two of America’s most famous inventors and industrialists. Thomas Edison began wintering here in 1886 and his friend, Henry Ford, built a home next door in 1916. Visitors will see botanical gardens, Edison’s workshop and Ford’s car museum as well as their inventions and memorabilia. Southwest Florida Museum of History is housed in a historic train depot. The institution is a gateway to the history of Southwest Florida. Fascinating exhibits chronicle the history of the region for thousands of years. Children can see a 12-foot giant sloth, an early 20th century railcar and a traditional homestead. The museum conducts walking tours and other special programs. Capt. Bob’s Half Day Everglades Adventure takes guests into the heart of the swamp. Highly regarded naturalists lead the expeditions and provide expert narration about this unique ecosystem. While aboard an airboat, you can see crocodiles, bobcats, whitetail deer, flamingos, bromeliads, orchids and cabbage palms. Back on dry land, you can enjoy an interactive reptile demonstration. Escape Zone is an indoor family fun center. Children can roller skate, play laser tag and miniature golf or enjoy bounce houses and arcade games. There is a balloon pit and play area for toddlers. Other popular games include the human hamster wheel and table tennis. Imaginarium is an interactive science center and children’s museum with over 60 hands-on exhibits. This popular destination has a touch tank, a 3-D theater, sports simulator and set where visitors can forecast the weather. Families can feel the fury of a hurricane, uncover fossils and see wildlife in the lagoon. The museum has a tiny tot play area and a variety of aquatic animals, including stingrays. Zoomers Amusement Park has a variety of rides and activities. There are bumper boats and water balloon battles. Visitors can enjoy the go-karts, roller coaster and midway style rides or pan for gold. Other popular attractions include bowling, arcade games, miniature golf and bowling. The park has chair swings and other midway rides for younger children. Lakes Regional Park is a 279-acre public green space. Visitors can fish in the 158-acre lake and observe a variety of waterfowl along the 2.5-mile nature trail. In addition to playgrounds, there is a scale-model train ride in the northern part of the park that travels beside the lake and through a small tunnel. Mote Aquarium is part of an ongoing research laboratory. The aquatic facility displays more than 100 species of marine animals. 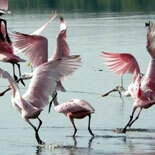 Visitors can see manatees, dolphins, sea turtles and sharks. There are windows where guests can observe the scientists as they work. The scientists demonstrate eco-sensitive, sustainable aquaculture production of caviar and sturgeon. Fort Myers to Key West Ferry is a great way to visit the legendary “Conch Republic.” The ferry has climate-controlled cabins and outdoor observation decks that enable you to enjoy the view as you travel. Your family can visit Hemmingway’s old haunts and enjoy the sights and sounds of America’s southernmost city. Soak up the charm, culture and history of this Caribbean destination.